Since 2001, each Creek Week Cleanup Day has included work sites to remove red sesbania, an invasive plant that grows naturally in southern South America. This plant is spreading rapidly along many creeks in north Sacramento and along the American River, threatening the existence of native plants used by wildlife for food and shelter. This plant grows right next to the creek and is spreading into sand bars in the water, increasing the risk of flooding. 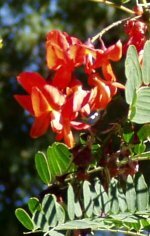 The California Department of Food and Agriculture considers it a serious threat to biodiversity, designating it a red alert plant. On Cleanup Day, Sacramento Weed Warriors, a volunteer stewardship project of the California Native Plant Society, supports a limited number of work sites, providing a site leader and all the tools and gloves needed for removing sesbania. Each site leader provides an introductory orientation regarding removal techniques and safe use of tools. Target sites will be listed on the Urban Creeks Council web site – so if your family, youth group, or student team wants to participate, you can look for a site closest to your home or school. If you want to volunteer, please contact Frank Wallace, SWW director, at 427-5694. Students as young as 10 have participated previously. Sesbania removal projects are usually a lot of fun for youth groups. These projects develop teamwork and friendships since there are several tasks of varying difficulty: First, the upper portions of the plant are cut off using pruning saws and loppers; then weed wrenches and shovels are used to remove the roots; and finally the vegetation is cut up and carried to a location away from possible flooding,-where it will decompose naturally. Volunteers usually rotate among jobs learning how to use the different tools. A group of 10-15 participants can make a big contribution to this invasive plant control effort. Since new sesbania plants will sprout throughout the year, Sacramento Weed Warriors will be supporting removal work groups and monitoring teams throughout the spring and summer. If you have a school community service project, a youth group, a business team, or a community organization that would like to volunteer, please call Frank Wallace. This entry was posted in Author: Frank Wallace, Creek Info, Volunteerships. Bookmark the permalink.